I loved the way the lobby looked as well as the ocean view that was given. However, parking is awful. When we first arrived valet tried to tell us to park across the street because they were full before we even checked in. Then we go to the room and there is no blankets. You just get white sheets. I would have to let them know about all this fees no parking. like the room it s clean big. Check in and out took a long time due to the volume of guests but I suppose that is to be expected. At first, we were given the wrong keys so that meant going back down and waiting again to get the issue resolved. The housekeeping and repair staff were all using guest elevators so it took forever to get to our room and their bulky equipment made us miss our floors cause we could not get past them. I am not sure where they kept the valet cars, but when we got ours back it was dirty with mud and feathers all over it. On the positive side, the rooms were really nice and clean, we had a good view from the room even though it was not an oceanview room. We were given the bed arrangement we asked for. The room had a small fridge and iron and fan which all came handy. The tiki bar and lobby bar staff were very nice and gave us plenty of tips on how to spend our Miami beach vacation. The pool area was also very large with plenty of lounge chairs. Overall, I would recommend this hotel despite some of its negative points just make sure not to use valet if possible and come and leave early to avoid the registration lines. Rooms were clean and attractive. The housekeeping and repair staff were using guest elevators. The Deauville Beach Resort, located in the center of Miami Beach, prides itself on outstanding hospitality. Magnificent views of the Atlantic Ocean, a large sparkling swimming pool and 700-foot linear sunny white sand beach make it a perfect place for a fun-filled holiday. There is a business center and Internet Kiosk for traveling executives. Wireless Internet is complimentary for all registered guests. 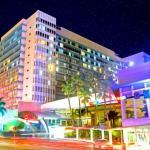 Bal Harbor Shops, shopping and dining venues of Lincoln Road, the South Beach Art deco District and the Miami Beach Convention Center are minutes away from the property, a half-an-hour drive from the Miami International Airport. Each of 484 sleeping rooms is equipped with a mini refrigerator, telephone with voicemail, iron, ironing board, safe, coffee maker, hair dryer and AM/FM alarm clock. Oceanfront rooms have terraces lending itself to the spectacular views of the beach and the Ocean. You can laze around in heated spa and / or in the outdoor swimming pool. To tone up your body, work out in the fitness center. Revel at the beach or enjoy Jazz performance at Arturo Sandoval Jazz Club. Taste local cuisine at Kon Tiki Tiki Bar and Café De La Mer & Lobby Bar and Restaurant. The 75,000 square feet of flexible function space can accommodate up to 2,000 guests.